Akure—THE Yoruba socio-political organisation, Afenifere, yesterday said that if the Independent National Electoral Commission, INEC goes ahead to conduct the Febuary 14 general election with almost 30 million voters cards yet to be distributed, the exercise will not be credible. In like manner, the International Society for Civil Liberties & the Rule of Law (Intersociety) alerted the Catholic Pontiff, Pope Francis; UN Secretary General, Ban Ki-moon and 11 Foreign Missions of looming trouble in Africa’s most populous country as a result of INEC’s alleged moves to disenfranchise 35 million registered voters. This came as the European Union Election Observation Mission, EUEOM, attributed the problems bedevilling Nigeria’s electoral process to what it described as the failure of government to implement the election reform recommendations it prepared for the country after the 2011 general election. The foreign organisation regretted that out of the 50 recommendations it prepared for the Nigerian authorities, following the 2011 polls, only one, adoption of the freedom of information law, was adhered to. Meanwhile, a renowned security expert, Dr. Ona Ekhomu, has called on the Federal Government to postpone the February 2015 general elections in the North-eastern states of Adamawa, Borno and Yobe to reduce the loss of lives and wanton destruction of property and allow the military complete its counter-terrorism operations in the zone. While reading the Afenifere communique, Odumakin said: “The assurance by the INEC Chairman (Professor Attahiru Jega) that they will distribute cards before the election is not reassuring. If you have failed to do it before now, what is the assurance that he is going to do it now? According to him, the “meeting viewed with seriousness the share incompetence on the part of INEC. The INEC that wanted to create 30, 000 polling units few weeks to the election has yet to distribute almost 30 million voter’s cards. When you look at the table INEC has given, what they tell us is that in each state, this is the PVC received, hiding the total number of registered voters. “Also, we want to warn in Yoruba land that we should be careful of those who promise change and do not believe in the restructuring of Nigeria and those who boycotted National Conference and described it as diversion. Leaders that attended the meeting include Governor Olusegun Mimiko of Ondo State, two former governors of Osun and Ogun states, Iyiola Omisore and Gbenga Daniel, Chief Ayo Adebanjo, Sehinde Arogbofa, Chief Olu Falae and Supo Sonibare among others. Meanwhile, Afenifere last night endorsed President Jonathan as its candidate for next month’s Presidential election insisting that President Jonathan is the right choice to rule the country and mentioned continuity as the reason for the endorsement. 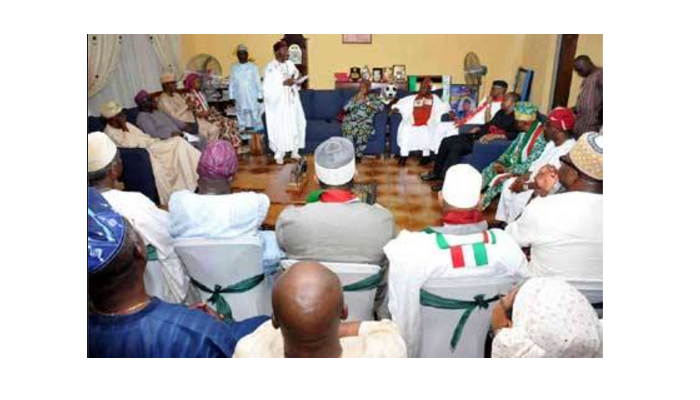 The prominent Yoruba leaders at the meeting including Governor Olusegun Mimiko and former Ogun state Governor, Chief Gbenga Daniel had earlier held a closed door meeting with President Jonathan at Fasoranti’s residence. The Afenifere leaders stressed the need for continuity of the lofty transformation programmes of President Jonathan, saying all Nigerians who appreciate good work must support Jonathan. President Jonathan who arrived Ondo State yesterday was received by Governor Mimiko and he is expected to address his supporters today at the Democracy park, Akure. Speaking at a news conference in Abuja, the EUEOM said it was incumbent on Nigeria to either adopt the recommendations or throw them away. He noted that flaws observed in the previous election which formed the basis for the recommendations were still in place. Ayxela, who said his team has been in the country since November, to monitor the forth coming general elections,at the instance of the Nigerian government, refused to disclose what the team had observed in the country’s present electoral system, preferring to give its assessment after the whole exercise. While reiterating the organisation’s position not to extend its observation assignment to the troubled North East geo-political zone of the country, Mr Fisas Ayxela, however, said his group would get situation reports from contacts on ground. In a detailed petition dated January 27, 2015, entitled: ‘’ 2015 General Elections In Nigeria & INEC’s Shoddy Preparations: Chaos, Anarchy & Bloodletting Looming’, the petition is signed for Intersociety by the Board Chairman Emeka Umeagbalasi; Head, Democracy & Good Governance Programme Chiugo Onwuatuegwu, Esq. ; Head, Civil Liberties & Rule of Law Programme Obianuju Igboeli, Esq. ; and Head, Campaign & Publicity Department Uzochukwu Oguejiofor, Esq., the group said: ‘’As of date, over 35 million Nigerians most of them registered voters have been disenfranchised by INEC.